Visual Voicemail for BlackBerry Bold? | BlackBerry Blast! BlackBerry Blast! 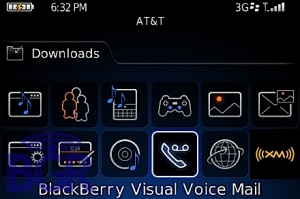 > News > Visual Voicemail for BlackBerry Bold? Visual Voicemail for BlackBerry Bold? Visual Voicemail could be coming to the BlackBerry Bold sooner than later. BGR is reporting that they have a tipster who sent some screenshots from a BlackBerry Bold with a Visual Voicemail icon on the homescreen. Pressing the icon results in a error but it sure looks interesting. The OS that the screenshots are taken from is 4.6.0.219 and the carrier is AT&T. Very interesting!